A bee is a member of any of the 20,000 species of insects belonging to the superfamily Apoidea in the order Hymenoptera. Among the best known types of bees are the honey bee (genus Apis) and bumble bee (genus Bombus and Psithyrus). The group includes thousands of wasp-like and fly-like bees as well. Bees generally known as "killer bees" belong to a subspecies of African honeybee that escaped from Brazil in 1957 while breeders were trying to produce a tropical hybrid. 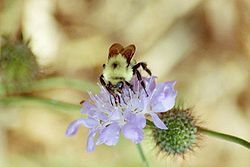 God created bees among, "everything that creeps on the ground after its kind" (Genesis 1:25-26 NASB) during the sixth day of the creation week. 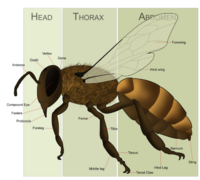 Morphology of a female honey bee. It can be identified as a female by both the number of divisions on its antenna and by its sting. Bees have the ability to reproduce sexually or asexually. The queen bee is the only one that produces fertilized eggs, but in the event of an absent queen, laying worker bees will lay unfertilized eggs. A queen bee that survives in a colony will go out on a sunny, warm day to mate with 12-15 drones. She has only a short amount of time to mate, and if she is unable to fly because of bad weather and remains unmated, she will become a "drone layer." When a colony has only drone-laying queens, usually the colony will eventually dissolve, because the workers have no fertilized (female) larvae from which to raise a replacement. If there is a shortage of drones or the weather does not provide enough time for a full mating, the queen may be able to function for the normal 2-3 year life span. If workers realize their queen is unsuccessful, and the weather will allow a replacement to be raised and mated, the bees can "supersede" the queen. However, replacement will fail in colder climates because there are no drones and the queens cannot fly to mate. Colin Maclaurin also took up the study of the honeycomb. He had participated in the development of the calculus after Isaac Newton and Leibniz, as every calculus student who has had to calculate the Maclaurin series may have suspected (Marsden & Weinstein, 1985). But for whatever reason, he decided to solve for the honeycomb angles without using "any higher Geometry than was known to the Antients [sic]." He calculated the angles to be 109=9A 28' 16" and its supplement, 70=9A 31' 44". It turned out that Konig had made a mistake in determining the square root of 2 and that the angles calculated by Maclaurin agreed precisely with Miraldi's measurement. This led to the dictum that the bees, "had been proved right and the mathematicians wrong," an error spread by Lord Brougham. However, it was eventually realized that this was an overstatement since, in reality, the bee cells, "are far from identical, and do no more than approximate to an average or ideal angle." Can it bee? by Jonathan Sarfati. Creation 25(2):44–45, March 2003. Deciphering The Mystery Of Bee Flight ScienceDaily, Jan. 12, 2006. This page was last modified on 10 October 2014, at 21:48.